Longtime community philanthropist Ruth Hyman of Long Branch chats with musician Elad Kabilio after the performance by his group, Music Talks. 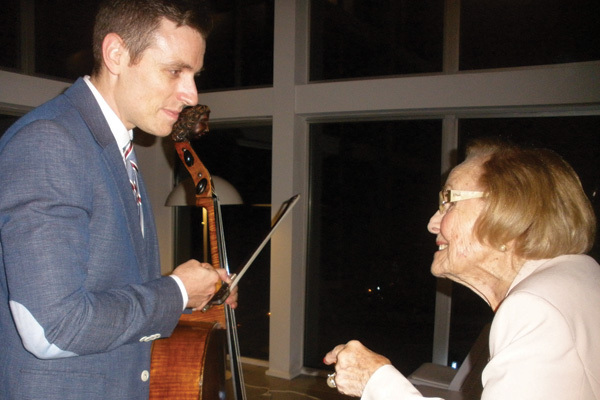 About 90 “major” donors of the Jewish Federation in the Heart of New Jersey gathered Sept. 21 at the Deal summer home of Len and Barbara Littman for good food and entertainment. But the more important reason for their gathering was to share the many reasons that support for federation is so critical. “I’ve been all over the world on behalf of federation,” Wendy Marks of Holmdel, a member of the organization’s leadership council, said at the event, noting that the federations gives its assistance to “take care of people suffering after terror attacks in Israel.” Marks told the group she is proud her own children are carrying on the tradition of caring for other Jews through their support for the organization. She added that she has also witnessed the programs and aid the federation provides locally, including support for day schools and meals-on-wheels for seniors. Each person in attendance, she said, has had similar moments that cemented their affiliation with federation. Federation CEO Keith Krivitzky spoke of the increased emphasis the federation has placed on security and working with police to resolve anti-Semitic incidents in an era marked by the threat of terrorism, helping to secure synagogues and other institutions. “We have established a great working relationship with law enforcement,” he said, noting that federation arranges training sessions for ushers and greeters on the High Holy Days and provides contacts for any situation that may arise. The minimum gift required to be a major donor is $5,000, and most of the attendees had already made their donation prior to the evening, said federation chief development officer Elena Herskowitz, adding that the gathering was “more of a thank you or recognition event,” than a fund-raiser. Entertainment was provided by Music Talks, a five-member New York-based musical group of Israelis trained in classical and jazz music — who according to group leader and cellist Elad Kabilio — discovered klezmer in the United States.